This here’s ALKALI — Last of the 49ers (aka Rick Toles), letting you know another year finds me riding the trail to bring my Gold Rush History and Music Programs to elementary schools, festivals, fairs, and civic events all over the state. With me I bring my eyewitness account of life on the trail and in the diggins. I’ll also drag along some of the musical instruments we used back then, like the fiddle, banjo, jaw harp, bones, button box, and musical saw, among many others. Rick Toles presents… ALKALI — Last of the 49ers… a humorous musical variety program based on the Argonauts journey to, and life in the gold fields. Alkali brings a “first hand” account of life on the trail west in ’49, featuring instruments and songs of the period. This entertaining journey back in time, features many period musical instruments including the banjo that would have been used then as well as fiddle, bones, button accordion and jaw harp among others. Alkali has performed at many venues over the last two decades including civic groups such as The Native Daughters of the Golden West, Lions Club and historical societies. He has also appeared at fairs and festivals and at many schools. 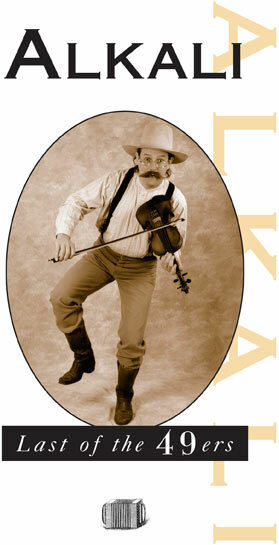 Alkali’s blend of accurate historical presentation and music and humor delights the young and old alike.